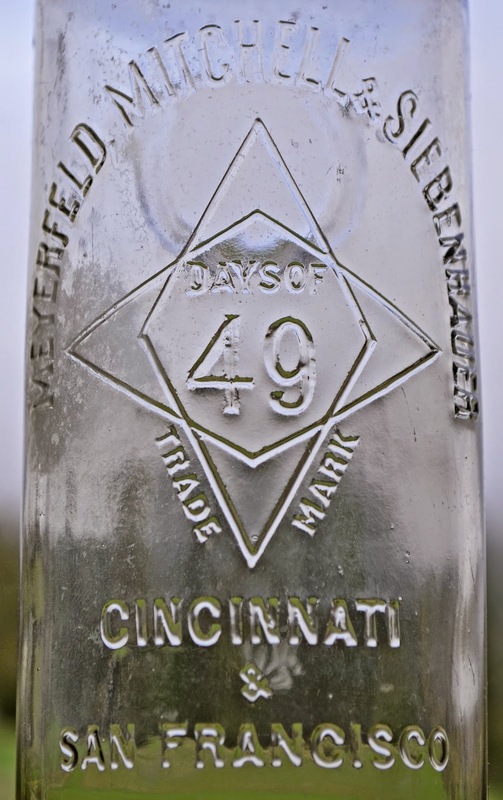 Last weekend, a friend of mine acquired the " Meyerfeld, Mitchell & Co. / logo – Days of 49 / Trade Mark / Cincinnati & San Francisco", which was on the Winter 2015 list. It's #552 in Western Whiskey Bottles 4th edition. 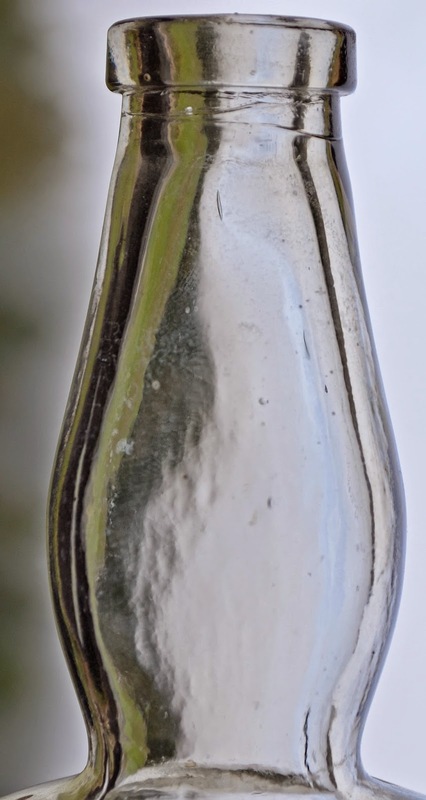 It was described as "tooled, clear with that hue in the glass that says it'll turn deep amethyst, bold strike, bulge neck, slight content residue, nice example, (you should see their saloon sign! ), last one we had was 2005." During the course of conversation, we got to discussing the comparative rarity of this variant vs. the similar Days of 49 embossed "Meyerfeld, Mitchell & Siebenhauer". He asked which I thought was the tougher of the two. My knee jerk response was that we've always thought they were about equal in scarcity. After all, Wilson had them pretty close to even in Spirits Bottles of the Old West, and Bob also had them neck and neck in the Western Whiskey Bottles book series. I got to looking at my records and I stand corrected. I've had well over a dozen of the "M&M" variants over the years, and only one of the "MM&S" variants; all tooled as noted in the books. Looking strictly at the facts... "Meyerfeld, Mitchell & Siebenhauer" was only in partnership for three years; 1890 - 1893. This compared to Meyerfeld, Mitchell & Co., who were in business from 1894 - 1905 (perhaps, even through April 1906). Three years vs. a potential 12 year stretch. And the real push for the Days of 49 brand started well after the dissolution of the partnership with Siebenhauer. As such, I'd have to say that we've been well off base and the Siebenhauer is indeed a tough bottle. A new, and previously undocumented, "Days of 49" variant just surfaced. A glop top! Yep, you read it right, an applied top variant! It's a German Connection clear globby, very similar to the E. A. Fargo that floated to the surface last year. Just when you think you've seen it all! I think you've got it right. I've dug at least a dozen of the Meyerfeld , Mitchell's over the years, but never have even turned-up a piece of the Siebenhauer variant !